Jason Lombardi, Author at Malvern Historical Society, Inc.
A native of Malvern, Jason's love of history developed at an early age. He became self-appointed caretaker of the Hardesty Cemetery in Malvern at the age of approximately ten-years-old. While researching those interred at the burial ground, Jason made connections with numerous Malvern residents who experienced its history, building a foundational knowledge of historical events and data associated with the village. He served as historian of the Malvern United Methodist Church for a number of years which further perpetuated research of the area. While scouring the community for historical information, Jason connected with Malvern native Mrs. Frances L. (Thomas) Montella. Their joint efforts and common desire to preserve Malvern's past led to the formation of the Malvern Historical Society, Inc. in 1994. There are still many kind-hearted people in this world. Recently, the Malvern Historical Society was recipient of a donation which will help us in preserving our collection. Mr. Stew Benedict, active member of our society, is shown next to a donated fireproof filing cabinet which will help in safeguarding our one-of-a-kind documents. Stew oversaw transporting the more than 600-pound cabinet to Malvern and received assistance with getting the cabinet into the building from member John Chiurco. 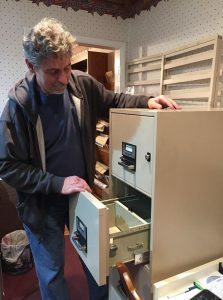 As custodians of Malvern’s history, we are responsible for the safety and preservation of relics which trace the footsteps of our pioneers; this cabinet will help complete that job. Small organizations like the Malvern Historical Society find it difficult to purchase large ticket items such as this on a limited budget. We are exceptionally grateful for the donation and send warm wishes to the generous person who saw fit to lend aid to a non-profit organization. Let it be known….the donor has no direct connection to the village of Malvern and, in fact, had to look us up to discover who we are 😁. This person wishes to remain anonymous. So yes, even in a world which seems dominated by the not-so-pleasant at times, there still are blessings in disguise. Our home is nestled into the downtown Malvern scene. We have an historically relevant storefront structure which dates from maybe the 1870s-1880s. 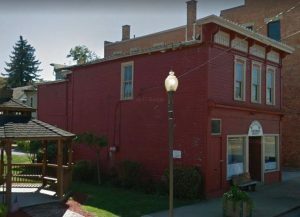 Last year, we were fortunate to be recipient of a substantial grant to help restore our aging structure, namely the foundation, painting the exterior, and remodeling the second level. As of now, we have the funds to repair the foundation, but we need a structural engineer to give us some recommendations as to what exactly needs to be done! We know there is an issue, however, we are not expert in this area to say precisely what needs addressed in effort to take the next step to hire someone to fix it. Please, pass the word…do you know of someone who could give us a professional opinion of what we need to do for our foundation needs? Do you have your tickets for our August 19th community program: Frank L. Craig Legacy Series Premier? 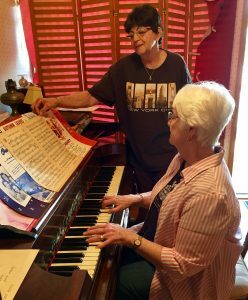 As an added bonus to the presentation, Malvern Historical Society Treasurer Linda Byrd will be treating guests to live 1940’s and 50’s music at the keyboard. Remember, tickets must be purchased in advance with multiple ways to acquire them; there will be no ticket sales at the door. Want a discounted ticket? We will offer a $5.00 discount to anyone who brings in a pre-1970 Malvern newspaper for us to add to our collection or to scan and return. Regular ticket price is $10 and includes a luncheon, live music, and a presentation. Out-of-state guests will make the day a special occurrence. Many familiar 1940’s and 50’s Malvern faces and scenes will be projected up on the big screen at the new Malvern School Cafetorium as part of the program. The luncheon will include treats directly connected to Malvern’s past. The countdown is on….Saturday, August 19th will be here before we know it! Grab a ticket and enjoy some time with your neighbors, have a bite to eat, and reminisce with us. You may just see one of your family members or friends up on the big screen! Malvern Historical Society Treasurer Linda Byrd (seated at piano) will be treating guests to live 1940’s and 50’s music at the keyboard. Society Secretary Sonia Strock is pictured looking on. Malvern Newspaper Treasure Hunt Earns Discounted Tickets! 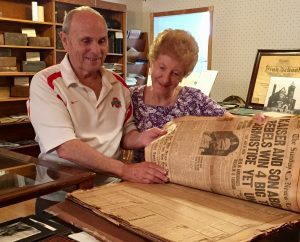 Jim and Betty Castellucci are shown taking a peek at some century-old newspapers in preparation for the Malvern Historical Society’s premier of the Frank L. Craig Legacy Series which will debut on Saturday, August 19, 2017. The Castelluccis have their tickets for the event…have you picked up yours😀? The Malvern Historical Society is inviting all to participate in a treasure hunt for back issues of any Malvern newspaper printed prior to 1970. “We are currently working on a program that will tell the story of Frank Craig, editor and publisher of Malvern’s Community News during the 1940s and 50s. Craig left a lasting legacy to our town and he is a great example of the difference one person can make in a community,” says Jason Lombardi, president of the Malvern Historical Society. “I have learned we can scan issues of the newspapers at the Cleveland Public Library. Once scanned, the copies will be recorded on a computer thumb drive and the information will be preserved for future generations. Also, the scanned data will be searchable. That means we will be able to enter a family name and quickly find any story where that name appears,” Lombardi says. “Copies of these old papers will greatly enhance the historical society’s records. We need the public to search through old albums and cedar chests where keepsakes are often kept; to search their grandparents’ attics and to contact friends and relatives who might still have copies, ” Lombardi requests. “We believe many issues are still out there and saved because they contain special stories about the owners’ lives — wedding announcements, births, academic and sports achievements, and other important life events. We will welcome all copies donated to our collection, or we will be glad to just borrow copies long enough to scan them. The papers will not leave our possession and in most cases we can return the originals in a week or two. ***Anyone who donates a pre-1970 Malvern newspaper or allows us to borrow and scan a copy will receive a $5 discount on a ticket for our August 19, 2017 luncheon and program, ” The Legacy of Frank Craig.” It will be held at the Malvern High School Cafetorium. The doors open at 11:30 a.m. and lunch will be served from noon to 1 p.m. The program will follow lunch. Those who attend the event will be treated to a basket with a Red’s Coney Island hot dog, made with the secret sauce recipe used during the 1940s and 50s by Red Romano at Red’s Nite Club and Bowling Alley. The basket will also include a bag of hot potato chips, like those enjoyed by generations of school children at the “Bazaar Shop” run by Elsie Schmidt near the old school building on West Main Street. For dessert there will be a selection of cookies baked from recipes found in old Malvern family and church cookbooks from that time. The price of the tickets are $10 and can be purchased at the Malvern Historical Society on Saturday mornings from 10 a.m. – 12 noon, or by calling Linda Faa at 330-863-1185, Linda Byrd at 330-863-1222, or Sonia Strock at 330-863-0149. See comments below for additional avenues to acquire your tickets! Author Jason LombardiPosted on August 2, 2017 Leave a comment on Malvern Newspaper Treasure Hunt Earns Discounted Tickets! Tickets for the Frank Craig Legacy Series premier are now on sale at Crowl Interiors and Furniture located at 403 North Reed Avenue. Their hours of business are Monday, Tuesday, Wednesday, and Friday from 9 a.m. to 5 p.m. and Thursday from 9 a.m. to 7 p.m. and Saturday from 9 a.m. to 3 p.m. Feel free to stop by their establishment and pick up your tickets for the August 19th presentation/luncheon. Many thanks to Crowl Interiors and Furniture for assisting us in the ticket sales! August 19 Historical Society Event! The sights, sounds, and tastes of Malvern during the 1940s and 50s will be recreated on Saturday, August 19th when the Malvern Historical Society kicks off the first of a series of programs designed to tell the stories of individuals who have left an enduring legacy to the village. “We have had a tremendous response to the information we post each week on the Malvern Historical Society’s Facebook page,” says Jason Lombardi, society president. “Current and former residents join the weekly online Facebook conversations. Some folks raise questions about our history, others contribute missing facts, and many share warm memories. All the discussions remain on our page for those who would like to visit the social media resource. “The program we are planning for August 19 will expand this kind of historical exploration to include a big screen program of old photos, music from the era, and some little known facts,” Lombardi says. The focus of the first program will be the story of Frank Craig, editor and publisher of the Community News during the 40s and 50s. Craig moved to Malvern from Brookville, Pa. He became the publisher of the Community News following the 1941 death of Art Lewis. Craig became familiar with every corner of the village as he gathered the news, called on merchants to sell newspaper ads, wrote most of the stories, set the type for his old printing press, and printed weekly editions of the newspaper. While in Malvern, Frank Craig served on the Malvern School Board and drove a school bus. He also drove what was called “the youth bus.” It was used to take kids to pick strawberries in Augusta, to visit parks as far away as West Virginia, to out-of-town skating rinks, and to high school sports events. Frances (Thomas) Montella was a cheerleader at the time and says that she and Betty (Swisshelm) Zartman would not have been able to cheer at away games if Frank Craig had not taken them on his bus. The Craigs had three children: Patricia who lives in Carmel, Indiana; Augusta, who lives near Lima, Ohio; and Frank, Jr., a writer and former editor of the Pittsburgh Tribune. Patricia and Augusta are planning to attend this event. They will share memories of their father and their time in Malvern. Frank Craig, Jr. is currently traveling the country conducting interviews for a new book and will attend if his schedule permits. Jason Lombardi’s program will show how Frank Craig used his passion, influence, time, skills, interests, and intellect to leave an enduring legacy. It will be presented against a backdrop of the sights, sounds, and happenings in Malvern during those years. The event will also include food from the era. The Red Romano family as given their approval for the Society to use Red’s secret sauce for the popular Coney Island hot dogs he served at Red’s Nite Club and Bowling Alley during that time period. Those who attend the event will be treated to a basket with a Red’s Coney Island hot dog, a bag of hot potato chips, like those enjoyed by generations of school children at the Bazaar shop run by Elsie Schmidt near the old school building on West Main Street. For dessert there will be a selection of cookies baked from recipes found in old Malvern family and church cookbooks from that time. Program committee chairwoman Linda (Cinson) Faa is pictured here (left) looking over a vintage Malvern cookbook brought in by society follower Lorraine (Galay) Baldwin. As guests arrive for the luncheon and program, they will hear songs from the era played on the piano by Linda Byrd. Tickets for the event are $10 per person and all proceeds will be used by the historical society to buy materials to preserve its collection of rare and one-of-a-kind photos and documents. Space is limited and we will need to have an accurate luncheon count, so tickets will not be sold at the door. Tickets can also be purchased at the Malvern Historical Society building, 108 E. Porter Street, on Saturday mornings from 10 a.m. – noon or by calling Linda Faa at 330-863-1185, Linda Byrd at 330-863-1222, or Sonia Strock at 330-863-0149. Also, the option is available to mail a check made payable to Malvern Historical Society, P.O. Box 80, Malvern, OH 44644 for purchasing tickets. The event will be held at the new Malvern School Cafetorium located at 3242 Coral Road NW. The doors will open at 11:30 and lunch will be served from noon to 1 p.m. The program will follow lunch. Get your tickets soon! Tickets must be purchased in advance. Thanks to dedicated members of the Malvern Historical Society such as Stew Benedict, a significant reminder of Malvern’s past is coming to life once again. The historical corporation limit markers acknowledging Malvern was the birthplace of Theodore Newton Vail will soon be re-erected at their sentinel posts at the east and west ends of the village along Canal Street. The signs, badly weathered by time, were last restored in late 1997 by historical society member Donald Eick. 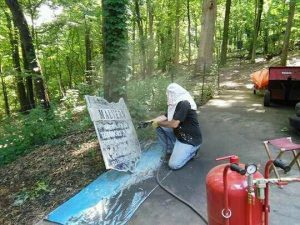 Stew is shown here sandblasting the historical corporation limit markers in prep for continued restoration. Photo credit: Pam Benedict. The signs read: Father of Railway Mail and Long Distance Telephone Services. They were initially installed in 1973 with grand celebration. We purposely chose today to feature Stew’s efforts in commemoration of the birth anniversary of Malvern’s own Theodore Vail who was born July 16, 1845. A son of Dr. Davis and Phebe (Quinby) Vail, Theodore was born in downtown Malvern. The Vail home still stands, but not on its original location. It was first situated at 100 East Porter Street where now stands the Victoria Building, home of the Contini Insurance Agency. The Vail home (built by Dr. Davis Vail around 1840) was built on this site and was moved to its present location (119 Second Street) in 1903 when the three-story, brick Victoria Building was constructed. An interesting fact: when the Vail home was situated on Malvern’s square, the family installed a water pump on their front porch which furnished the village with drinking water. Keep in mind, the home also served as the medical office for Dr. Vail, so it was a busy spot. The historic birthplace of Vail suffered significant fire damage last year, however, the property owners have rescued the dwelling and remodeled, saving the structure from total loss. Theodore only spent the first few years of his life in Malvern before the family relocated. Known as “Doe” and “Theo” by friends and family, Vail went on to make a memorable name for himself within the communication industry. • Assistant General Superintendent of the Railway Postal Service in 1874. While in a position of leadership, Vail was responsible for inaugurating this faster delivery of mail service for the American people. Train service was initiated for the sole purpose of mail delivery with little stopping between destinations. He later became general superintendent of this service. • In 1878, Vail was persuaded to leave his post at the governmental mail service and explore a professional career with Mr. Alexander Graham Bell. • Under Vail’s leadership a nationwide campaign of telephone service was launched with local companies multiplying; telephones could not be constructed fast enough! • Vail was the first general manager of the Bell Telephone Company. • He significantly assisted with establishing the Western Electric Company which was organized to manufacture the Bell telephone. • Vail’s dream of transcontinental telephone service came to fruition in 1915. Theodore Vail’s ideas were decades ahead of his time as other financiers of the day focused on maximizing profit with rapid expansion; Vail wanted focus on integration and quality of service. The panic of 1907: Up until this point (Vail had resigned by this time due to frustration with the developing industry’s business practices), Bell Telephone was borrowing tremendous amounts of money to keep up and lenders were getting hard to find. The banking systems of the U.S. demanded management invite Vail back to run things…Vail returned. His reputation alone restored the financial community’s confidence in the Bell Telephone Company. Vail then was determined to buy out rival telephone companies or sell out if that was his only option for the advancement of one nationwide system. Society member Stew Benedict is feverishly bringing new life to Malvern’s Theodore Vail signs. 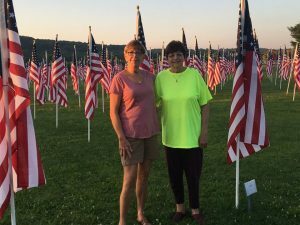 Thank you to dedicated Malvern Historical Society members Charm Woods (left) and Sonia Strock (right) for lending a hand at the Field of Honor. We are privileged to have such leading, community-minded citizens represent us at this historic event. 1940s & 50s Malvern Comes to Life at Upcoming August 19 Historical Society Event! The Malvern Historical Society is alive and flourishing and we have some superb programs lined up for the community! “We have had a tremendous response to the information we post each week on the Malvern Historical Society’s Facebook page,” says Jason Lombardi, society president. “Current and former residents join the weekly online Facebook conversations. Some folks raise questions about our history, others contribute missing facts, and many share warm memories. All the discussions remain on our page for those who would like to visit the social media resource. The program we are planning for August 19 will expand this kind of historical exploration to include a big screen program of old photos, music from the era, and some little known facts,” Lombardi says. Those who attend the event will be treated to a basket with a Red’s Coney Island hot dog, a bag of hot potato chips, like those enjoyed by generations of school children at the Bazaar shop run by Elsie Schmidt near the old school building on West Main Street. For dessert there will be a selection of cookies baked from recipes found in old Malvern family and church cookbooks from that time. As guests arrive for the luncheon and program, they will hear songs from the era played on the piano by Linda Byrd. Tickets for the event are $10 per person and all proceeds will be used by the historical society to buy materials to preserve its collection of rare and one-of-a-kind photos and documents. Space is limited and we will need to have an accurate luncheon count, so tickets will not be sold at the door. Tickets can be purchased at the Malvern Historical Society Building, 108 E. Porter Street, on Saturday mornings from 10 a.m. – noon or by calling Linda Faa at 330-863-1185, Linda Byrd at 330-863-1222, or Sonia Strock at 330-863-0149. Also, the option is available to mail a check made payable to Malvern Historical Society, P.O. Box 80, Malvern, OH 44644 for purchasing tickets. 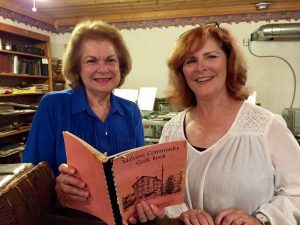 Program committee chairwoman Linda (Cinson) Faa is pictured here (left) looking over a vintage Malvern cookbook brought in by society follower Lorraine (Galay) Baldwin. Author Jason LombardiPosted on July 9, 2017 July 9, 2017 Leave a comment on 1940s & 50s Malvern Comes to Life at Upcoming August 19 Historical Society Event! For those who may have missed the live radio broadcast, please follow the link below to listen in and watch the final episode of the Malvern story as featured on Larry Hackenberg’s “The Time Machine”. Four episodes in total aired on Canton’s 1480 WHBC over several Saturdays, highlighting some fascinating areas relating to Malvern’s history. Please take a look and listen at this third installment of Mr. Larry Hackenberg’s “The Time Machine” as featured on Canton’s WHBC radio station by following the destination link below. A total of four broadcasts featuring Malvern will be presented with shows airing on Saturdays at 1 p.m.
Before Moses Porter: Malvern’s First Occupants-A Look at Brown Township’s Native American Ties. Need a Last Minute Christmas Gift that Celebrates Malvern’s History? Dave LePore on Before Moses Porter: Malvern’s First Occupants-A Look at Brown Township’s Native American Ties.